No one on campus had seen the granite boulder known as the Peace Rock in its entirety since April 25, 1914. That’s the day the rock was buried by students opposed to the abolition of the annual Class Scrap — a fight that pitted second-year men against first-year men. 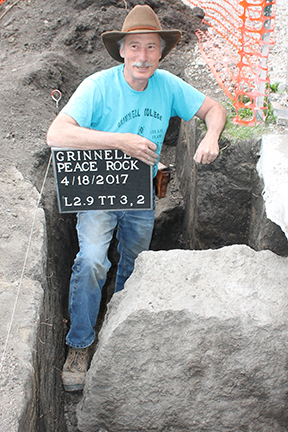 During the spring 2017 semester, students in John Whittaker’s Archaeological Field Methods class worked on excavating the Peace Rock with the help of other faculty members, anthropology majors, and local historian Byron Hueftle-Worley ’81, who has taught a class about the Peace Rock at the local library. Whittaker and his students used ground-penetrating radar and other tests to locate the rock. They found what appeared to be the granite boulder about 75 yards east of Carnegie Hall, near the Humanities and Social Studies Complex (HSSC) construction site. 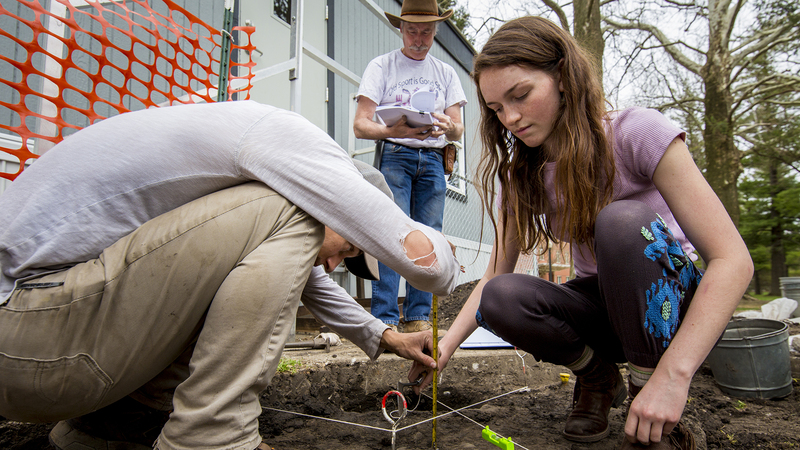 But after 40 person-hours of digging with no sign of the Peace Rock, the students and Whittaker were ready to give up — until Hueftle-Worley began pushing a rod into the earth in the area surrounding the dig and eventually hit something hard. The class quickly excavated it, exposing the end of granite rock. Class Scraps often resulted in black eyes and broken bones, Hueftle-Worley says. 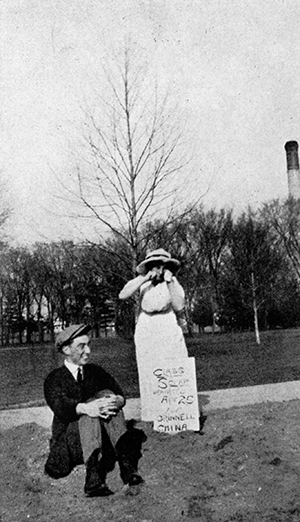 But in 1913, a student was killed in a Class Scrap in Wisconsin, prompting Grinnell College’s then-President John Main to proclaim the evils of the Class Scrap and call for its abolition. The Peace Rock first appeared on campus in 1913, when the planned Class Scrap was replaced by a gathering of first- and second-year men on a farm with a large granite boulder about 2.5 miles west of town. After a night of celebration, they pushed a large piece of the boulder into a cart and pulled the cart by hand back to campus. They unloaded the stone, declared the Class Scrap was dead, and announced that the Peace Rock symbolized the end of the fighting. Upper-class students who didn’t want the Class Scrap tradition to end began to attack the Peace Rock in April 1914. First, they covered it with red paint. Then they tried to blow it up with dynamite from a local hardware store. The peace rock will be incorporated into the landscaping for the HSSC.